Canaries are happy little easy-care birds who brighten up their surroundings with song. Most canaries learn to sing from older birds when they're very young, around 6 weeks old, but a single canary can learn to sing later in the right environment. Male canaries are the singers of the species, although female canaries can sing too, some quite well. Both sexes mimic the sounds of song they hear from other birds. Males sing more readily though, so if you're shopping for a singer, look for a male. Set your canary up for singing success with optimum surroundings. Canaries need exercise and like to fly back and forth. Give your bird a rectangular cage at least 20 inches wide with perches at either end so he can fly. A round cage doesn't offer the opportunity for a canary to stretch his wings. Place the cage in a room with activity, out of drafts. Canaries enjoy sunlight, but be sure your bird also has shade if he's in a sunny spot. Place your bird's food and water dishes so they're easily visible to him. Avoid covered dishes; canaries do not like to put their heads inside a cover. 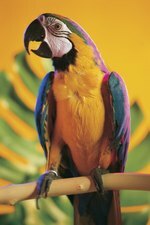 Offer a good quality, all-purpose food of seed or pellets made for canaries. Supplement his food with fresh leafy green vegetables or fresh fruit daily. Apples, broccoli, corn and carrots are canary favorites. Provide a bird bath several times a week. Canaries love to bathe and will do so often. Cover the cage from dusk till dawn so your canary can feel safe and rest properly. Keep the cage and dishes clean to avoid disease. Change your bird's water daily. Natural singers, in the wild, canaries claim their chosen territory with a song. So once your canary is comfortable in his surroundings, provide him with encouragement to sing. Purchase a recording designed for canaries and play it daily near his cage. The recorded bird song replicates what a young bird hears from his elders and will prompt him to sing. Once he begins to trill, add recorded music to his playlist and he will likely enlarge his repertoire. Canaries take time off from singing during molting season, which usually occurs in mid- to late summer, so don't be alarmed if your bird goes quiet when his feathers start to fall. Be especially careful to keep him out of drafts and his cage clean during molting. Molting season usually lasts for four to six weeks. Once it's over, your bird will begin to sing again.